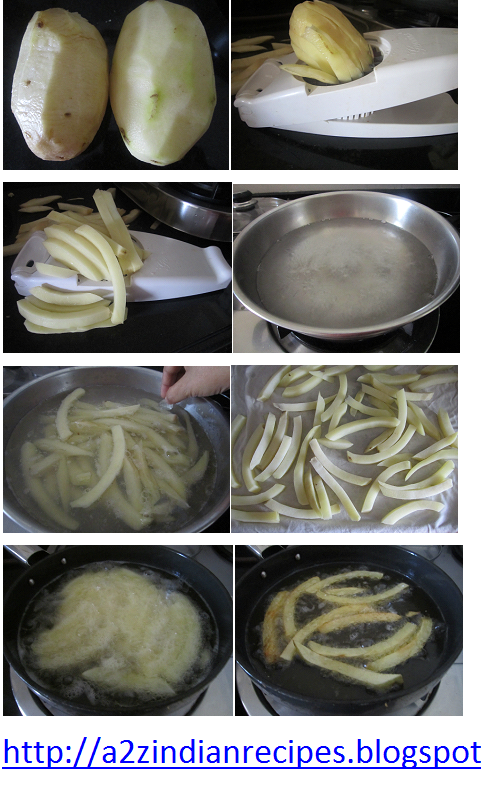 Peel off potato make french fries with the help of cutter or if you dont have then do it with knife. It should be 1/2 inch in width and length depend on your size of potato. Heat water in pan, after it boils add salt and fries. Then insert alum in water and move your hand in circular fashion, then immediately remove alum. Stir well for 2-3 min. Then switched off the flame. Remove slices from water on to a cotton cloth. With the help of another cotton cloth remove water from slices. Water should get removed. Allow it to cool for 5-6 min. Then heat oil in kadai. After oil gets hot then add fries and fry till becomes crispy. The flame should be constantly medium high throughout procedure. After it is removed from kadai keep it on tissue paper to remove excess oil. Sprinkle salt & pepper and serve.